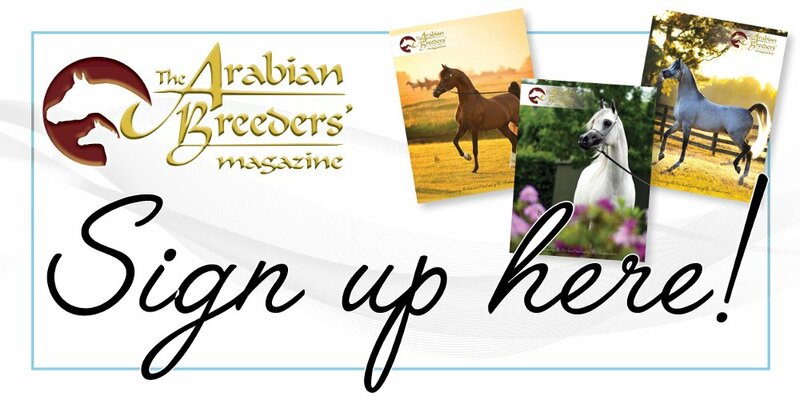 Sheikh Ammar has a clear vision when it comes to his breeding programme, and from carefully considered foundations, he has built a group of outstanding Arabian horses. He has bred amazing foals, who have gone on to shine around the world, dazzling people with their type, beauty, elegance and refinement. Indeed, from the Ajman mares, comes great legacy; from the Ajman sires, comes great foresight. And nowhere will that be more evident than in Paris this year. AJ Samara is a yearling filly who has danced her way across Europe this year. An exquisite and feminine bay, a true crowd favourite, and one who has been Gold Champion every time she has been shown. This incredible filly is extremely important to everyone at the Ajman Stud, for she is out of Sheikh Ammar’s homebred stallion AJ Mardan. Foaled in 2011, Mardan is by one of the farm’s most enduring sires, Vervaldee (Versace x Giavanna), and Mardan truly is at the heart of Ajman Stud. He is out of the Brazilian beauty Felicia RLC (Shael Dream Desert x Camelia K), and he has impressed from the moment he was born. 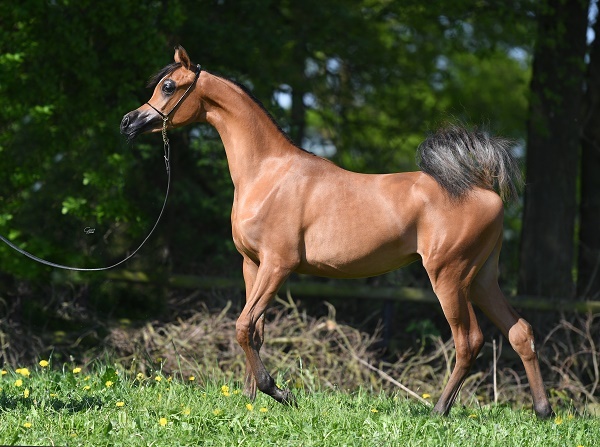 Already a notable sire, AJ Mardan’s 2014 son AJ Azzam (ex Yasdora by Marwan al Shaqab) took the 2015 European Triple Crown – winning titles at the All Nations’ Cup in Aachen, the European Championships, and the Paris World Championships. AJ Azzam represents just one of many winning progeny of AJ Mardan, and AJ Samara is the next bright star to come from this line. AJ Samara’s dam, meanwhile, is the multiple-champion mare Sama AM, sired by Eden C (Enzo x Silken Sable) and out of Sara al Mohamadia (Marwan al Shaqab x ZT Maghan). AJ Samara has been shown just four times to date and each time, she has placed gold; no small feat given the increasing quality of the youngstock classes across Europe, and the amazing company she has been in. Her first show was the Elran Cup, held in July. There, she was named Gold Yearling Female Champion – the first of many awards that would come her way this year. At the same show, AJ Samara was also named the Crowd’s Favourite, a huge honour for this glorious filly and her connections. From there, Chantilly and the Arabian Horse Organization World Cup beckoned. With her show career already off to a flying start, AJ Samara took her second Gold Yearling Female Championship in a row and was also named Best in Show – no small feat for a yearling filly when up against the senior horses. The award underlined the quality of this amazing filly – one who is elegant, refined, correct, and who oozes quality. The title shows then beckoned, beginning first with the All Nations’ Cup in Aachen. There, again, AJ Samara was garlanded with Gold, taking her third title in a row and proving herself to be every bit the lead contender for the rest of the 2018 season. And indeed, come the European Championships at the end of October, AJ Samara took her fourth title, claiming the Gold Yearling Female Championship once more; this time, it was unanimous. Daring to dream is always something that many choose not to do; however, one could certainly hope that AJ Samara will continue her golden career come the Paris World Championships at the end of this month. For not only would the much-deserved title be recognition of the continued success and growth of Sheikh Ammar’s breeding programme, it would also cement her sire, AJ Mardan, as a true sire of note and one to be reckoned with for the coming years. This beautiful filly, however, is not the Ajman Stud’s only homebred contender at this year’s Paris World Championships. For AJ Kafu is also going for glory and he, too, represents two generations of Ajman breeding. AJ Kafu is sired by Shanghai EA (WH Justice x Salymah EA), a white stallion with a host of titles to his name and owned by Sheikh Ammar. AJ Kafu’s dam is their homebred beauty AJ Kahayla. 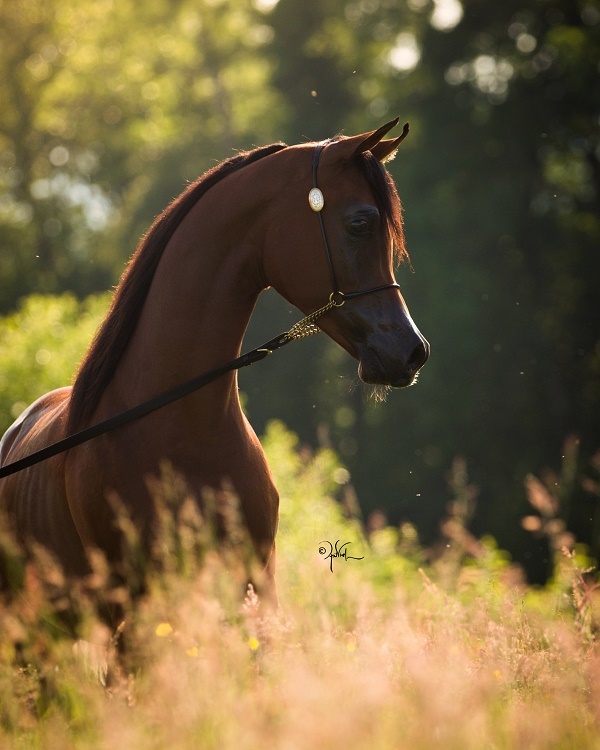 Her sire is another much-garlanded stallion, QR Marc (Marwan al Shaqab x Swete Dreams) while her dam is one of the finest mares ever to leave Poland, the phenomenal Kwestura. Just as Vervaldee captured the hearts of the Ajman team, so Kwestura has done the same. She is sired by Monogramm (Negatraz x Monogramma) and out of Kwesta (Pesennik x Kabala). Kwestura is the reigning queen of the Ajman Stud, and her get and grandget are fulfilling the promise that she offered the eastern lands. And AJ Kafu is a brilliant example of this. Foaled in 2015, this three-year old grey colt has enchanted from the moment he was born. His exotic looks have charmed judges and audiences alike, and the famous video released this year, of him dancing through the desert to the music of Catlin de Ville, melted the hearts of many. AJ Kafu had truly arrived. As a yearling, his first show was the Emirates Arabian Horse Breeders’ Championship and AJ Kafu began his career as he meant to go on, taking the Gold Yearling Colt title, a feat he followed up just a few weeks later at the Abu Dhabi International Arabian Horse Championships. AJ Kafu then took the Silver Yearling Colt title at the Dubai International Arabian Horse Championships. As a two-year old, AJ Kafu continued to shine although he was shown only once. Returning to Dubai, he claimed the Junior Male Championship in style. As a three-year old, AJ Kafu returned to the show ring, commanding this year’s Mediterranean and Arabian Horse Championships in Menton. Not only did he win his class against strong competition and unanimously win the Gold Junior Male Championship, he was also named Best in Show Male. He, too, shone in Aachen in September, taking the Gold Junior Male Championship. Now, like AJ Samara, all eyes will be upon him at the Paris World Championships. AJ Kafu means a lot to those at the farm, not least as a precious, proud grandson of the great Kwestura. He offers so much to those passionate about the Arabian horse – type, beauty, substance, and he is definitely one to watch in the future, not least as a future sire of note. Finally, the Ajman Stud will also be showing their very successful yearling colt Admiraal in Paris. Bred by Al Muawd Stud, Admiraal joined Sheikh Ammar’s herd to bring in the lines of his sire, Emerald J (QR Marc x Emandoria), as well as those of the lovely mare Haniyyah (Psytadel x Hanina). Admiraal has had a phenomenal first year in the show-ring, starting with taking the Gold Yearling Colt Championship at the Prince Sultan Arabian Horse Festival in the Kingdom of Saudi Arabia. Admiraal added a further Gold title at the UK International Arabian Horse Show, and then went to the title shows. In Aachen, at the All Nations’ Cup, Admiraal was unanimous Gold Yearling Male Champion and at the recent European Championships, he was once again garlanded in gold. It is clear that the Ajman Stud has had an incredible year in the show-ring, and fingers will be tightly crossed that, come Sunday 25 November, they may add yet more titles to their already impressive collection. With the chance to win not one, but two, Triple Crown titles, from two incredible Arabians, nerves will be high. However, quality always shines through, and AJ Samara, in particular, has been described by many as the most correct and beautiful Arabian filly you could ever hope for. Add in the dynamism of AJ Kafu and the power of Admiraal – both so typey and showy – and I think Sheikh Ammar may dare to dream. After all, it is one thing to breed a champion; it is another thing altogether to realise those dreams, and to do so in such style. And if anyone can do it, the horses from this beautiful farm in Ajman certainly can.